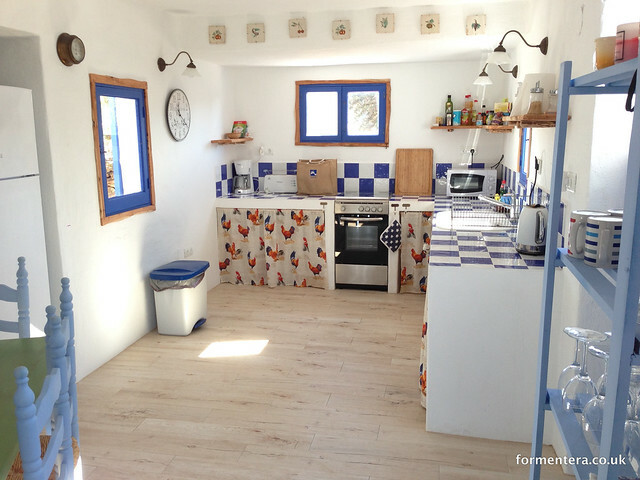 A very charming, rustic house in the beautiful area of Portu Saler. Fantastic views to Ibiza and the port of Formentera. The property has simple interiors, with large terraces for outdoor dining. The main annex has a living room with TV, panoramic views from a large picture frame style window. External kitchen off large covered terrace, external doors to rear terrace. The second annex has a double bedroom, intercommunicated with the third bedroom with bunk beds, external door to rear terrace. Bathroom. The house is large enough for 4 adults and 2 children (sleeping in bunk beds). The house may also sleep 5 adults (the 5th adult would sleep on the lower bunk bed). The price stated for 6 people must include one child. The house does not sleep 6 adults.